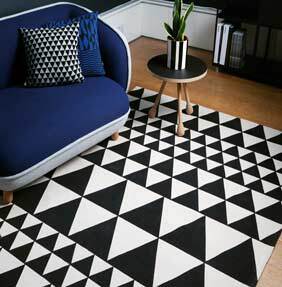 Cleverly designed using mixed production methods, the Onix Rug range has a bold graphic feel. The designs are screen printed onto the quality cotton rug and this method allows the collection to cover many different patterns and styles from floral rugs to cool and contemporary geometrics. Onix is a collection which is proud of offering fantastic value for money as well as great quality. Onix rugs are part of the Fashion Floors Collection by Asiatic Carpets and this whole range celebrate the fun and the funky on-trend designs for your home. Each Onix rug is made from 100% cotton flatweave and they are hand woven and printed in India. Each rug features a hard-wearing backing to ensure they are perfectly designed for the modern home.